You do not need to be a student or faculty member to use our online resources if you're on campus. You can login to any of our journals, databases, and other resources for free from the library or our campus (if you're using the school's WiFi). Although we have many great databases to choose from through the Drain-Jordan Library, we generally like to send students to Academic Search Premier to start. This is for a few reasons. 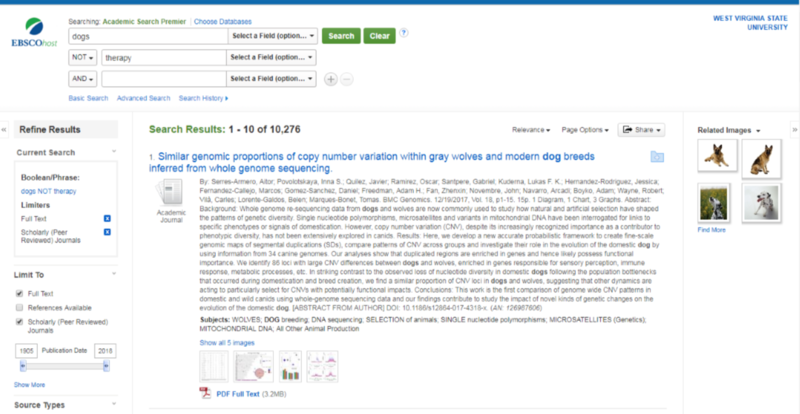 It's our largest database, and the collection contains a variety of both general and major-specific resources, including eBooks, periodicals, journals, articles, book reviews, videos, and images. This means that you could theoretically write an entire research paper using only sources from Academic Search Premier. It is also hosted by EBSCO, where we subscribe to 21 other databases that can be accessed from any EBSCO interface. Additionally, it's great way to introduce students to doing advanced searches and using limiters, which many of the other databases also have in a slightly different format. Think of this guide as a stepping stone to learning how to use our other databases. 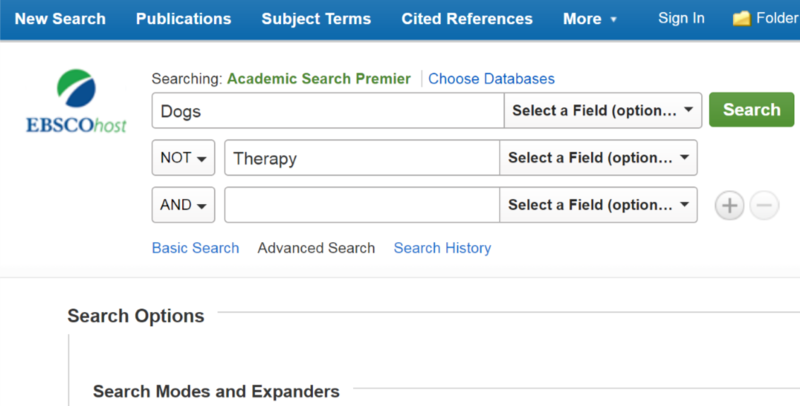 Once you've gone to our Alphabetical List of Databases and clicked on Academic Search Premier, the initial search interface will look like the one in the image below. (If you're logging in from off campus follow the steps in the Database Introduction and Off Campus Access tab). This is the same setup for all EBSCOhost databases. The default database will be Academic Search Premier. 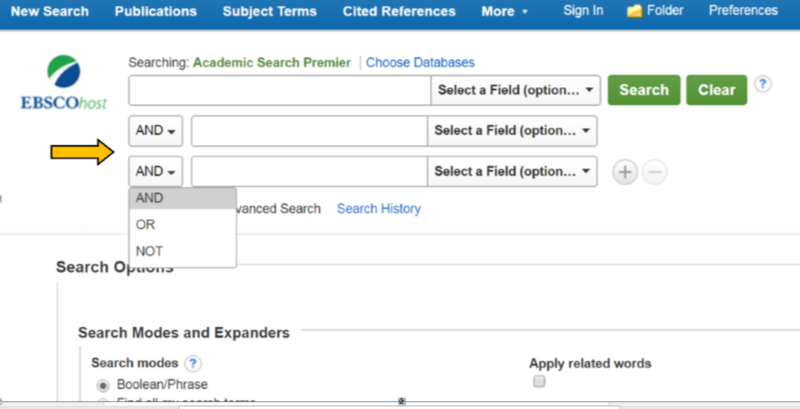 However, by clicking on Choose Databases you can select alternate EBSCO databases to search from, or you can choose Select all and search them all simultaneously. Generally, you would limit the databases you search based on your topic or major. For example, a business major might want to choose Business Source Complete and Regional Business News, whereas an education major might choose ERIC or Primary Search (which searches elementary school magazines). *This is also where you can select eBook Collection (EBSCOhost), to search our eBook collection. Once you've chosen your database(s), you're ready to begin adding limiters to your search. If you leave Select a field (optional) in place, the terms you enter in the search boxes will find sources that contain those terms in the article summary/abstract. 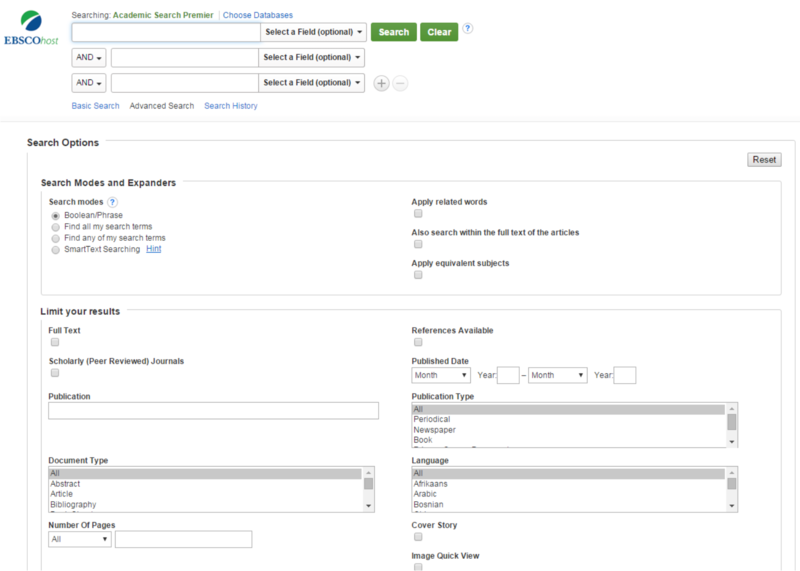 You may change the pull-down menu selection next to the search boxes to search by AU Author, TI Title of the article, SU Subject Terms, SO Journal Name, and more. Click the boxes beside Full Text and Scholarly (Peer Reviewed) to retrieve only scholarly/peer reviewed articles with full text available. (Full text means that you will have access to the entire article.) Some teachers require peer reviewed articles and some don't, but it's a good idea to check that option so ensure you have the best quality sources. To find articles published within certain dates, use the pull-down menu to select a month and fill in the year box with the appropriate year. Once you've done that, you're free to search for your topic in the search box, using your search term(s) or keywords. The image above shows where the Boolean Operator pull-down options are available. You can use AND, OR, and NOT to either limit or broaden your search. Use AND to narrow your search. Your results will include all the search terms you used in the initial search. For example, if you were searching for dogs AND therapy, you would get results with both of those terms in the article abstract, rather than one or the other. Use OR to broaden your search by connecting multiple terms, but not requiring they both be present. For example, if you were to search for dogs OR therapy, you would get some results on dogs, some on therapy, and some on both. Use NOT to limit your search by excluding certain terms. For example, searching for dogs NOT therapy would exclude any results that referred to dogs that were being used for therapy. Below is an example of how you would format your search using Boolean Operators in an EBSCO search box, using the examples from above. Once you have done this, click the green Search button and view your results. Below is an image of what your results will look like if you used the terms in the example. From this search, we got over 10,000 results. That's a lot more than you would be able to go through, so you may want to add more limiters (such as additional Boolean Operators, subject terms, or date published) to get more relevant results. There are a couple of things to pay attention to from the result list pictured above. The first is the PDF Full Text link at the bottom of the article abstract. Full text articles may also say HTML Full Text. Clicking on this link will allow you to view the article in its entirety. We can also see what format the content is in by looking at the icon below the title of the article. This resource in particular is an article from an Academic Journal, which is pretty standard for this type of search, but you will also regularly see results for eBooks and book reviews. If you want to opt out of any of these types of resources, you can do so from the Refine Results box to the left of the results page. After you have done that, go ahead and click on the PDF Full Text link. Your article should look similar to the one below. Along with being able to read the article in its full text format, there is another interesting perk of using our library databases. On the right-hand side of your screen you will see a toolbar. From there you can email the article to yourself, print it, save it in a folder to come back to later, or cite the article in 9 different citation formats (including MLA, APA, and Chicago). EBSCO will have already generated this citation for you, so you won't need to do it yourself. Make sure to double check each citation though, as sometimes the formatting can be weird. Almost all of our databases that offer access to full text content offer this citation resource. And that's it! By following these steps, and integrating what you've learned in our other databases, you're well on your way to finding great resources through the Drain-Jordan Library and beyond. If this is still not making any sense, feel free to come to the Library at any time and ask someone on the reference desk to walk you through these, or any, of the steps required to find good resources. Or Ask Us! We're always happy to help!